I studied counseling in school, and it was there I learned the phrase "I feel". It was a tool used to teach people how to interact with others during difficult discussions. Rather than directing a comment at someone else, you begin with "I feel...". This tactic often diffused heated conversations and kept them from becoming attacks on one another. It allowed words to flow and understanding to be found. And that's all great. However, "I feel" can become a dangerous tool to use. While it's good to let people know how their actions impacted you or were interpreted, "I feel" can be a slippery slope. In fact today I see more people using it to direct decisions they make, and that can lead to some scary places. 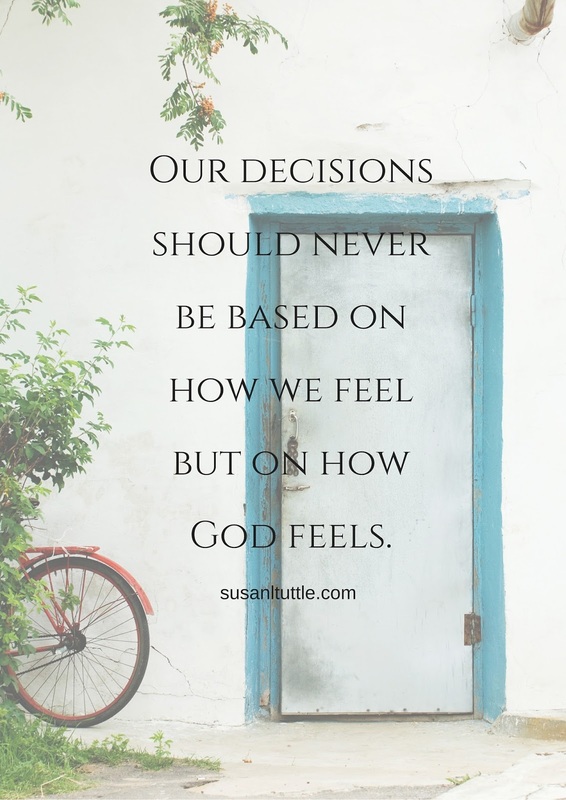 That's because our decisions should never be based on how we feel, but rather on how God feels. Friends, every day we face moments that our feelings can overrun. From struggling with the comparison game to remembering our past doesn't define us, we have a tendency to let our emotions grow louder than God's voice. We pick up Facebook or Instagram to tell us we're loved and worthy instead of opening our Bibles. We let the counsel of friends confirm our anger is warranted instead of sitting with God and asking him about forgiveness. Or we simply stew in our thoughts and allow them to become the authority over our minds instead of allowing God's truth to transform them. But if we want to live our lives in the abundance and freedom that Christ offers then we need to drop the "I feel" and take up the "God feels" statement. Stop allowing your feelings to manipulate the truth in your life. Your feelings will change, but God's truth will always remain. Susan, this is so beautiful! I hope tons of people stop by to read your post today, and I'm so glad I did.